At Cessna Aircraft Company, Wichita, Kansas, a mission critical machining cell consisting of three Trumpf routers was bogged down due to persistent control problems. The cell produced 60% of the parts used in Cessna planes. The backlog in the cell forced Cessna engineers to outsource work at a cost of a million dollars a month. Solving the problem was essential. The trouble was, Cessna engineers didn't want the same old control retrofit choices theyd already triedhardwarebased, proprietary, and closing off each machine into an isolated unit. OpenCNC was completely independent of proprietary hardware. It ran on Microsoft Windows NT, from a single PC, with a single processor. OpenCNC was all-software and completely open: The Cessna team could network the machines, access them remotely from the field, integrate third-party software technologies, and upload and download part programs in seconds. 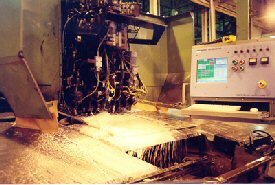 The routers improved feedrates and produced smoother part finishes. Machine utilization at the cell more than doubled. Uptime on the manufacturing cell was maximized to the point that all outsourcing was stoppedsaving Cessna one million dollars a month. Thanks to OpenCNC's patented real-time database for the collection and distribution of machine production and process data across a network, the Cessna team was able to identify and improve a key manufacturing process, the riveting/scrap removal process.